Continuing the series of Makers' Postcards, today's contribution is from multi-craftual Louise Atkins. Over the last 7 years, she has figured out all the best places to shop for yarn and fabric in Abu Dhabi, and when it's better just to take an empty suitcase to the UK to re-stock her stash. Hello everyone and can I just say that I was delighted when Sarah asked me to do a guest post on her blog - I, like the rest of her readers, eagerly look forward to seeing what she has to say and share with her the stories of her craft! I am a crafter whose main love is knitting, but I also crochet, sew and embroider and have been known to dabble in stamping, silk painting and hand lettering. Anyway, first things first, my name is Louise and I go by the name 'Louiseluvsyarn' pretty much all over social media and the strange world that is the internet. I was born and raised in the UK and until 2009 had never been out of the country for more than a two week holiday and would call myself a very British sort of person, I love things like Victoria Sponge, Miss Marple, tea (buckets of the stuff), walking through the woods, spotting a Robin - you know how it is! 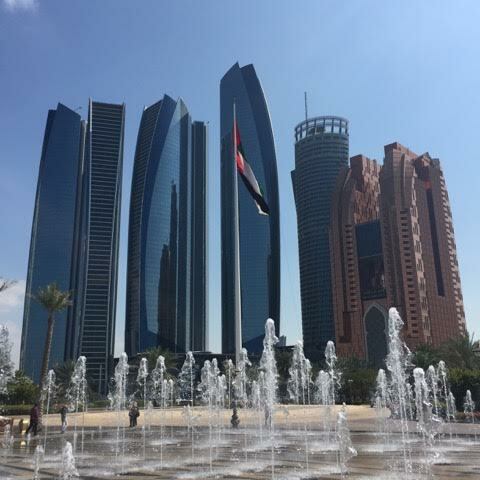 So when my husband came home one day and asked me if I fancied moving halfway across the world to Abu Dhabi I was a bit taken aback to say the least (and yes I had to run off to Google Maps to find out exactly where the heck Abu Dhabi was!). 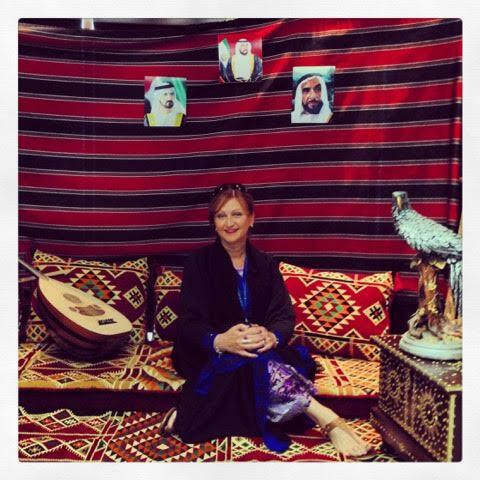 I knew this was the Middle East somewhere…….and it was rich from oil…...but that was it! So fast forward to February 2009 and we packed up the house and shipped off the contents and boarded the plane to Abu Dhabi and here we remain for the time being. When living in London, I have to say I was well and truly spoilt by the amount of crafting opportunities available! I was part of a Knit and Natter group which met at the local pub, I regularly had to take my daughter to stage school in Islington which meant lots of opportunities to go into Loop and I could get to Liberty or IKnit in my lunch break. When I arrived in the UAE there was not one proper wool shop pretty much in the entire place (I say ‘proper’ because you could get one or two balls of some very dodgy acrylic or fine white cotton to crochet the skull caps the men wear under their headdresses) although there are a LOT of fabric shops, but they do tend to have very elaborate beaded or bright fabrics - more on that later! Very luckily for me I came across the Ravelry group UAE Amiras and it only took me a few days to hook up with them and they quickly became my crafty lifeline. These are a bunch of fabulous ladies of many different nationalities, happy to share and swap and quickly pass on information about new craft supplies they found! The sad thing is that this is a very transient society so we do lose as many members each year, as join - there are just two or three of us original members left!!! So I guess my craft was really influenced by the materials I could get. To begin with this was mostly by ordering over the web. Not that this was always easy because some places still do not ship to the Middle East and although I have a Shop and Ship account where I can send items to my ‘address’ in the UK or US, this can work out to be costly in postage and also has the constant element of surprise! Unless you know the brand well, you can’t ‘squish’ and often parcels have gone missing, turning up months later, or not at all. So one way of getting round that is to go home once a year with a practically empty suitcase and fill up the shelves. I think this gives new meaning to ‘knitting from the stash’ - it’s not too often that I buy yarn for a specific project. Another interesting conundrum in the UAE is the weather. If you are asking…..yes its very HOT! 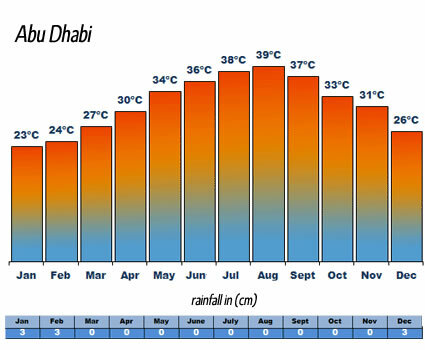 It's a normal 'summer' day - around 45C with wind and dust - heat factor is around 54C. Between June and October, venturing outside comes with a health warning! You will see people out at 5am or 11pm but even then the humidity is a killer - especially for an English girl with Celtic roots and freckles. But during these months the air-con has to be pretty high so, strangely, knitting or crafting indoors is reasonably comfortable. During October to June the weather sways between about 18 and 30 degrees (slightly warmer than a British Summer) and so we don’t have the air con on - but it can be warm to knit. Mind you I knit less in the ‘winter’ because that's when I can go outside in comfort and not burn or sweat to death. Firstly we have the opportunity to buy some of the big name brands (Sirdar, Patons etc) in one of our Bookshop chains, Magrudy. One of the Amiras originally worked with them on their ranges and we briefly saw some Malabrigo, Artesano and Dream in Color - sadly that did not last, but if you are looking for cheaper brands and especially for kids' knits, these are a welcome addition. For an eclectic mix of things from which you can sometimes find a gem, we have Daiso. This is a Japanese brand and pretty much our version of a £ or $ store - with the exception that 80% of their stock is actually useful! A few of these have sprung up in Abu Dhabi and whilst they may not have exactly what you went in for …… you will always come out with something, even if its a little row counter which fits on your little finger. I said I would come back to fabric. There are A LOT of fabric shops mostly run by expat Indians who import many silks and fine chiffon type fabrics. This is because we have very many tailors in AD and a lot of traditional Emirati ladies will wear gorgeous made to measure 'Jalabiya' under their 'Abayas'. Weddings and family celebrations are a chance for the ladies to go all out with glamour, and some of the dresses they wear for these sorts of occasions are pretty stunning. I was lucky enough to go to an Emirati wedding in the ladies section, where of course they are not covered and could see for myself the exquisite dresses which must take many hours in the making. I have not mentioned wedding dresses - these are a work of art and can be so heavy with beading that the bride has to be helped to walk! My favourite fabric shop is Cairo Fabrics in downtown Abu Dhabi and it’s probably the place most expats go to because it has the biggest range of fabric and you can usually find something you can work with. However if you are looking for a quirky Cath Kidston-type printed cotton for an A line skirt - then you will probably be out of luck! Finally the only place to go for notions is Malik and Shaheed. In this shop you can find all sorts of treasures and I noticed last time I was there, that they have a better range of yarn - not brands I know, but pretty none the less! This is much more of an old fashioned place (ok see the photo below - VERY old fashioned) where you ask for what you need and they come and present you with many options. Their trimmings are something else! But going back to my point above, they can be on the flashy side!! Here I get elastic, zips, buttons, cotton thread (not Gutterman but I can only buy that in one place in the city and its about £5 for a spool!!!!) and they are very cheap. However, again if you want something a little more subtle, ordering online has to be the answer. So I hope that this post has given you a little flavour of what it’s like in probably the richest city in the world! I can buy Gucci and Prada any day of the week (even if I had the money not sure that’s the thing for me) and we have 1,000 times more Jewellery and Watch shops than we do bookshops! The original Bedouins who founded the city created some fabulously intricate embroidery and the traditional architecture and calligraphy is truly stunning, so if you ever come to Abu Dhabi, ditch the Malls and search out what the city is really about. My eyes and my perspective have been opened, my crafting has made me new friends and I love the mix of different cultures…….. Just don’t visit in July! PS. I have not mentioned our “Super Shiny” cousin, Dubai - a couple of hours up the (only) road. Things are a bit more developed there - they have a LYS and their very own Indie Dyer - Dubai Knits - not to mention Satwa, the fabric district where you can probably get a fake version of that Cath Kidston print! You can find Louise online at www.louiseluvsyarn.blogspot.com and on Instagram, Twitter, Ello and Facebook as 'Louiseluvsyarn'. Remember that you can join in with the Makers' Postcards project too by sharing images and stories of how your location or travels influence your crafts - simply use the tag #makerspostcards on social media, and tag me @craftsfromthecwtch. I agree! Too hot for me! Brilliant postcard.. can't stop, I'm off to follow Louise all over social media! Great - Louise is lovely!! Suggest you copy and paste into your browser whilst I chase those pesky gremlins away!! Oh that's a very useful comment - thanks Charlotte!